Let me tell you a quick story before we scroll down to the 5 Tactics to dissolve exam day stress and anxiety. Maria contact me as she'd recently failed her Level 3 Nutrition exam through another provider. "I didn't know what I need to learn for the exam, the manual is so big, what exactly should I be revising?" Restless legs, a churning stomach and gripping the book in her hand so tight that her knuckles turned white as she walked into the exam room. Her self-talk sent her around in circles, thinking of worst-case scenarios and worrying about everything, replaying the same thought in her head over and over. "I don't feel I know enough"
As she met others on her course before the exam started it was evident everyone was cracking a fake smile, "maybe everyone else feels the same as me" - Maris asked! Yep that’s EXAM Stress and Anxiety! I want to BARK this from the tree tops! I am 100% confident you can collapse this exam day stress and anxiety using the 5 tactics below. 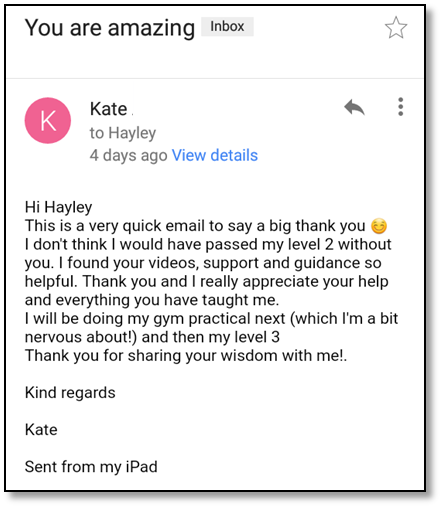 In fact the current 2500 active learners inside our L3 Nutrition Revision Mastery Academy have and are using this to confidently pass their Level 3 Nutrition exam with top marks. Read through the following 5 Tactics NOW. Regardless of the training provider that you are doing your exam through, and the set up on the day, there is one thing you can guarantee... You will be part of a group of learners that are all taking their exam at the same time. You can feel the tension in the air, and the quiet mutterings from every learner, looking for verification that they have done enough revision. Pre-exam nerves will send anxiety into a tailspin. Other learners will ask you about revision topics, or tell you they haven't done enough revision. They will tell you it is going to be tough and that they don't feel prepared. It’s crucial that you don’t listen to any of these negative comments. Do anything you can to avoid these conversations of how little revision your friends are done. A simple method is to look at your phone, or go to the toilet, or simply change the subject to a more positive one. It doesn't matter how you decide to avoid the negativity, as long as you be the gate-keeper to your mind. Be the gate-keeper to your mind. Take control on exam day and don't let other peeps lack of revision take you off-track! The definition of stress is "a state of mental/emotional strain/tension resulting from adverse or demanding circumstances." The thing with stress is that it shows a gap between where we are now and where we want or need to be. For example, you need to gain 70% on your exam to pass, but if you are currently getting 50% on your mock papers then there is a gap. This gap shows you that, taking the exam right now would be a demanding circumstance; a circumstance that requires you to improve by 20% without any further revision or study. This causes the emotional strain we feel as stress and anxiety. However, if you were well prepared for the exam then you would also have a lot less stressed and anxiety overall. Have you done enough revision in the right areas? Complete the 50 Level 3 Nutrition Mock questions from day 1 [Download again below] to test your current knowledge and highlight specific areas you need to work on! A revision strategy will you set you up for success and allow you to feel more control over your exam day result. Anxiety usually comes from a feeling of failure and lack of control. Having a revision strategy is your GOLDEN KEY. Learning and retaining all the knowledge required to ensure you turn up to your exam 100% confident. Confident in any question that could come up! I've placed an EXCLUSIVE OFFER for you below to gain full access to the Level 3 Nutrition Revision Mastery Bootcamp. Meaning you get instant structure to your learning and revision. Guarantee a pass and take a peak at what's included. Keep your day as normal as possible. Routine gives you a sense of control, so you want to keep as much of your normal routine as possible. Avoid the temptation to eat something different, do more exercise, skip breakfast, have more coffee… keep it as normal as possible. The moment you fall out of routine, skip a meal or add in an energy drink, your body is now flux with further stress response hormones meaning you feel even more on edge. Win back exam day control by sticking to a routine that works for you. A good nights sleep is the perfect antidote to feeling anxious. But it can be hard to sleep whilst you have revision notes and “to-dos” running through your mind. You find yourself lying wide awake mulling over origins and insertions, which side of the heart if the bi-cuspid valve alongside thoughts of what exam questions you'd like to come up! First grab yourself a pen and paper and put it next to your bed, jot down your thoughts and help stop the incessant runaway train in your mind. Next, think of 3 TOTALLY RANDOM objects, not related to your exam or studies in any way. REPEAT these 3 objects over and over again - and I guarantee the next thing you know, you'll be waking up by your alarm. Remove any 'inner chatter' overnight by writing it down and fall asleep to 3 RANDOM objects repeated over and over again - try it! Cheat Sheets To Every Module - Make revision easier again and test your knowledge as you go! Instant Learning Hacks - Understand how to learn, revise, retain knowledge for your exam day and download a proven weekly revision planner. Learning Secrets - Know the EXACT exam day strategy that has helped 1000's already pass their exam! Unlimited Student Support - have a Question? you're NOT on your own! What are the 6x level 3 Nutrition Revision modules? Each video module is specifically mapped to your level 3 Nutrition section in your manual and the leading awarding bodies: Active IQ, YMCA and VTCT. Each module has 1 video, 1 cheat sheet and can easily be downloaded to MP3/MP4. Each video is approximately 45 minutes long and details the complete “Ins & Outs” of the A & P section of your course. Each video is interactive, works alongside the downloadable cheat sheet and maps directly to Active IQ, CYQ and VTCT exams. There is no assessment for the revision mastery series. It is designed to leave you competent and confident for your Level 3 Anatomy and Physiology exam, with your current training provider. If you find learning and revising from a course manual tough, frustrating and hard to absorb, this interactive revision series will 100% help! 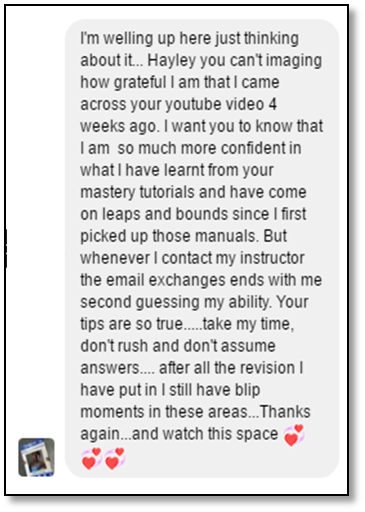 Check out the testimonials below as most learners buy the L3 RMS for this reason. If you are currently studying for any Level 3 Anatomy & Physiology exam, maybe it’s for a fitness course qualification, within health, well being or as part of your GCSE or A-Level studies… These 7 modules will guide your revision to a confident pass! All of the resources are housed on our secure membership area, so you will need internet access to gain access to the modules. HOWEVER, you are able to download each video straight to MP3 or MP4, allowing you to save it to your phone/ tablet/laptop and watch or listen over and over, even without internet access. Lots of students have used this when working out, driving, going for a walk… You can save time, so there is no excuses stopping you from passing your exam first time with confidence.